It must have been about ten years old, when I first read The Hound of the Baskervilles” and as many dark stories thereafter it had left quite an impression on me. Above all I particularly remember the gloomy atmosphere and landscape, which felt so exotic and exciting to me. I had never been to England, nor had I ever seen the moorland. Though we often read about sceneries we’ve never seen or that may not even exist in reality, we create these in our minds like an amateur movie. That’s one of the great things about reading: it gives us limitless freedom to use our imaginations , while films take most of this creative process out of our hands and feed us with pre-casted pictures. And what if we did have the opportunity to go and see these places we have read about? Would it be a disappointment, to recreate the scrapbooks we have put together in our minds? I’m an atmosphere collector. I’ve come to understand many books much better since I have been to the places they are set, providing that the author herself/himself has actually been there. In particular this applies to 19th and 20th century writing. On a sunny winter afternoon in early December, I took the train from York to Keighley in West Yorkshire, a town best known for its heritage railway that used to serve villages and mills in the Worth Valley and has now become a tourist attraction. But I had not come all the way to see an old railway. While the sun was disappearing in the dusk, I asked my way around town in search of the bus station. The distinctive Yorkshire accent had started to make me a bit nervous, but thankfully everyone was very nice and patient with me. I arrived a bit late to the Bus Station and asked around for the bus to Haworth, which, as it turned out, I pronounced utterly wrong. The correct pronunciation is something close to “Howarth”. I found the bus. It was a small village bus full of local elderly people and after a few stops I figured it went a totally different route from what I had found online, hence I had no clue where to get off. It must have been obvious that I was lost but the bus driver promised to let me know the right stop. In the end he also organized some sort of a guide for me. By the time I arrived, it was dark. Following the instructions of the local bloke serving as my guide, I finally found what I was looking for. There, glowing in the darkness, half hidden behind trees and gravestones lay the Brontë parsonage. It was no disappointment. Everything was just perfect. The moon shone between clouds that looked like cobwebs in the dark blue sky. The withering gravestones looked like old teeth sticking out of the moss-grown earth. The parsonage was simple and, at that relatively late hour, so quiet that I could almost hear the rustle of old dresses against the wooden floor. It was here that the sisters had written almost all of their famous novels, that Branwell had painted his portraits, and where all of them had died. It is a strange feeling to walk through the room where somebody died. It is even stranger still, to visit the house where three of the most talented women in British literature created almost all of their writing and spent highly productive years of their short lives. Would their energy ever leave their home, which will forever be connected to their legacy? 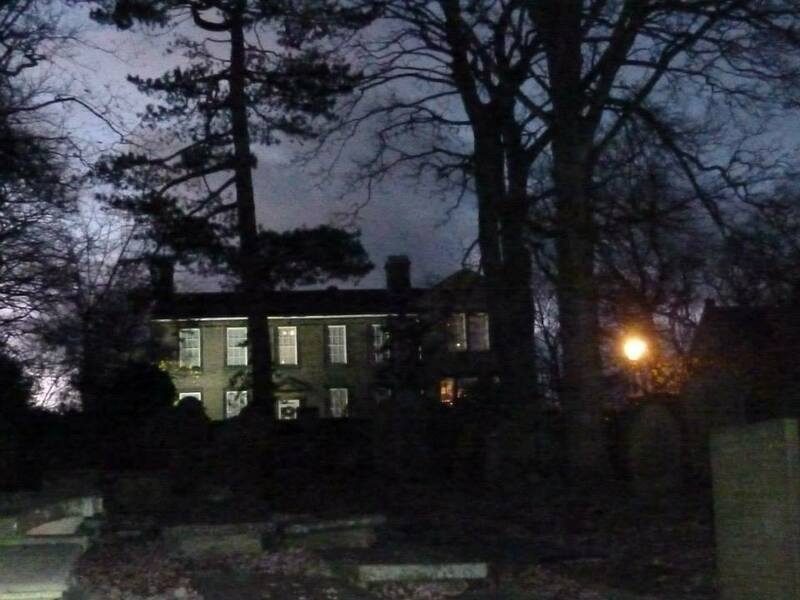 Here are two pictures I took behind the Brontë parsonage…. it could be an answer for those, who believe in such things..